This post is not actually about english muffins. It is about how to create a simple, tasty stand-in for an english muffin. I will admit that nothing could replace a tasty, fresh english muffin, but most of us eat the kind sold in the market. They make great toast, but are hardly exceptional. Unfortunately, though undoubtedly worth doing, they are time consuming: raise the dough, shape the dough, repeat and bake on a griddle. To bypass this tedium and still produce the great flavor, open texture and extreme toast-ability of an english muffin, I turned to a batter bread. A batter bread is one that is simply mixed and transferred directly to a baking tin. There is no hand kneading, no shaping and only the briefest rise time. This is the perfect type of yeast bread for those who are beginning to dabble with home baked loaves or more experienced bakers who are short on time. This particular recipe, as I discovered, is perfect for those of use who like toast. The recipe comes from King Arthur Flour this week. It is incredibly easy. Mix, divide and bake. The final product is moist and slightly yeasty. The crust is crisp and the crumb is coarse and a bit irregular. It makes fantastic toast. Use lots of butter and jam. Grease two 8×4 inch loaf pans. Dust sides and bottom with cornmeal. In a large mixing bowl, combine 3 cups flour, yeast, sugar, salt and baking soda. Whisk to combine. Add milk and water and stir until smooth. Gradually add remaining flour, continuing to stir until dough is smooth. If using a stand mixer, use the dough hook and work the batter for about 4-5 minutes, until smooth and uniform. Divide batter evenly into prepared pans and use your fingers to even the tops. Cover with a dish towel and let rise for 45 minutes. Bake loaves for 25 minutes. Remove to a wire rack and allow to cool for at least 30 minutes before slicing.Makes 2 loaves. I am crazy about english muffins! I think I’ll give this recipe a try this weekend. I’ve made this before as well – this is very good bread! A great way for beginners to start into bread. Funny, that was the first bread I made when I got home from vacation. I must say, I didn’t use KA recipe and again, I must say….your results look BETTER! You know….the crumb..your has more holes! I’ll give your version a try! M – I’m glad you’re enjoying some of the recipes. I love pumpkin, too, so I probably will be using it more as the days get cooler. Sara – It’s so easy; you’ll love it! Joe – I agree. You can’t get any simpler than this in a yeasted bread. Melissa – I have been so pleased with the KA recipes that I’ve tried. I really should get one of their books. I love King Arthur everything. My parents recently took a trip to the “headquarters” and brought back all these cooking supplies/cookbooks. YAY! I was directed to your site from “banlieu blog” when I asked about Fried Green Tomatoes. I ‘ve bookmarked your post about it. Check out my NYC restaurant blog when you have a chance. 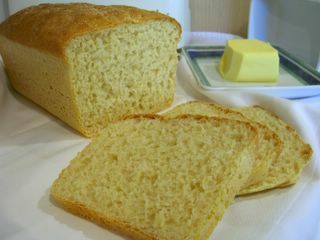 And that English muffin bread looks great, any way to make it whole wheat? Mona Li – To make this whole wheat, I would try using half white flour and half whole wheat, to ensure that you still got a good rise. You might need slightly less than the full amount of flour. I would also use 1-2 tbsp of honey instead of the sugar, just because I feel that honey adds a nice flavor to whole wheat breads. Mmm… I love english muffins! =) I should try this soon — maybe it will break me out of my bread failure rut. 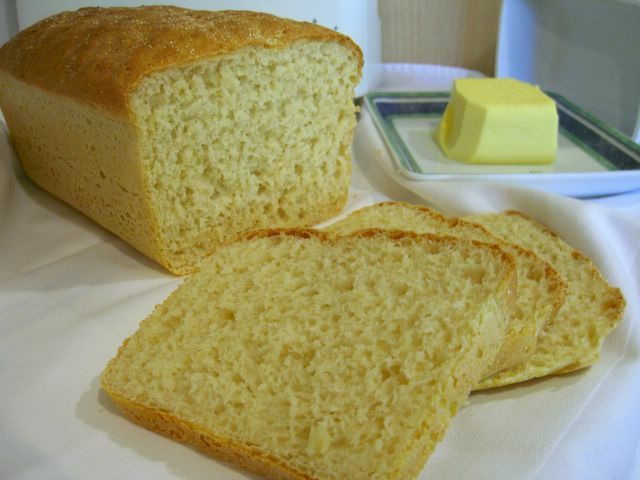 Hi Nic – I’ve always been tempted by these English Muffin Bread recipes, but never gotten around to trying one. I like the idea of using honey and some whole wheat flour. Hmmm… long weekend coming up, maybe time to make bread! Nic, I love english muffins and the batter on this bread looks just like it. Will give it a try. Kelli – You’re breads always look great. If you’re having problems, I’m sure it’s the weather! Cathy – Long weekends that don’t involve travel are made for baking. Ana – I hope you like it! oh man. saw your not-fried green tomatoes down the page. im making some fgt tomorrow, im craving them now. Violet – Check out http://the_samantha_files.typepad.com/; Samantha is hosting this round of Blogging By Mail. I can’t wait to try this recipe. I’ve never heard of English Muffin Batter Bread (oops, should I be admitting that? : ) It looks and sounds fabulous–and so easy. I’m planning to make some chocolate brownie cookies later today, but maybe I should make this bread instead. Hmmm. Wait a minute, what am I saying? Chocolate first! Tomorrow then. : ) Thanks for sharing. Hmmm, I may have to try this. But I started looking for an english muffin recipe, remembered I’d seen Michelle post something relevant recently, and it was this. If had been some corporate recipe I might have blown it off, but no, it’s yours! shakes fist! I shake my floury fist at you, Nic! Now I am going to make one more thing today–I have wheatberries cooking for bread and FG’s Pita recipe prined on the counter. Buf I still want a real english muffin recipe! I tried this bread today. Wow, it was fantastic! While I do enjoy kneading bread, this was easy and tasty. I’ll keep it around for those weekends when I want to bake bread but don’t have much time. Thanks again for this great recipe! So I made this with 100% whole wheat flour, as it was all I had- and Nicole is right, you need less, and it definitely didn’t rise very well! I also added mulberries to mine; turned out pretty good if I do say so myself =) I’m in the process of uploading photos on flickr.com/limelicious right now if you’d like to have a look! I was wondering if the directions would be any different if I halved the recipe to make one loaf instead of two. Or if it can be halved at all?